Back of Beyond Baking: Baking or Chemistry? As I mentioned previously, last week we went back to the big city to meet up with my gang of nanny comrades and as ever my dear friend Gem and her family were our hoteliers for the duration of our stay. 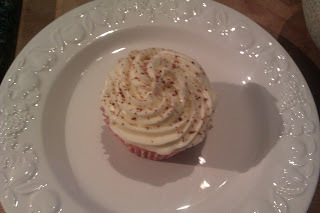 As a gift for our hosts I decided to try something new from the Hummingbird bakery cook book. As always the cake needed to be gluten free for Gem. I try and make it my mission to make regular cake but with gluten free ingredients and hopefully make the cake unrecognisable as gluten free. I find that moister recipes work best for gluten free because when gluten is removed some of the moisture goes with it. The black bottom cakes in the hummingbird book seemed to fit the bill as they have cheese cake added to rich chocolate cake with cream cheese frosting on top. As I started to read through the ingredients my doubts started to grow. The chocolate cake had no butter in it, no egg in it but water and white vinegar added to it. I was pretty convinced this couldn't work but set about making it with some scepticism but also a kind of science experiment interest in what the result might be. I followed the instructions and found the "cake" mixture so dry I couldn't flatten it into the cases so I added some extra water to counteract the gluten free flour and Xantham gum. The cheese cake mixture seemed quite runny and I am still not sure it was right but I had got this far so decided to add it to the cake cases and hope for the best. When the cakes were done, my niece and I looked at the cakes and looked at each other and decided that they would need tasting because I did not want to make cream cheese frosting for what looked like unappealing cakes. So we shared a cake and actually it tasted good. The chocolate sponge was rich and moist and the cheese cake tasty, even though it looked more like an egg custard on top. My niece and I agreed that once topped with cream cheese frosting no one would know what ugly duckling cakes lay underneath. Obviously once topped with cream cheese frosting we had to try the cake again. Pretty darn good! Gem was thrilled with her 10 cakes, although not so thrilled by the moreish nature when she is supposed to be eating healthily. She tells me that they only lasted 4 days before being stale so definitely one to eat now rather than save for later. For the chocolate sponge base put the flour, sugar, cocoa powder and bicarbonate of soda in a large bowl and mix with a handheld electric whisk on slow speed until all the dry ingredients are well incorporated. Continue to beat until all the ingredients are incorporated (scrape any unmixed ingredients from the side of the bowl with a rubber spatula). Line a 12 hole cupcake tray with paper cases. Spoon the mixture into the paper cases until two-thirds full and set aside. For the cheesecake filling, beat together the cream cheese, sugar, egg, vanilla extract and salt in a freestanding electric mixer with a paddle attachment (or use a handheld electric whisk) on medium-slow speed until smooth and fluffy. Scoop about 1 tbsp of the cheesecake filling on top of the cupcake mixture and bake in the preheated oven for about 20 minutes, or until the cupcakes are firm to the touch and they have an even golden colour on the cheesecake filling. Don’t overcook as the cheesecake will become very dry and crumbly. For the cream cheese frosting beat the icing sugar and butter together in a freestanding electric mixer with a paddle attachment (or use a handheld electric whisk) on medium-slow speed until the mixture comes together and is well mixed. If you wish to make a regular version of these cakes exchange the gluten free flour for regular plain flour and omit the xantham gum.